In the blue corner is Intel's Pentium D range, offering good performance, PCI Express and good compatibility with existing PCI cards... and in the red corner is AMD's Athlon X2, with a few compatibility problems, but easier to cool and offering better performance.... and in the red corner is AMD's Athlon X2, with a few compatibility problems, but easier to cool and offering better performance. If you've been waiting and wondering whether to 'go dual-core' in your next PC upgrade, which processor to choose is only one of the factors to consider. We discuss the options and implications. I've always stuck by my recommendation to upgrade your PC's processor only when you can get at least a 50 percent increase in CPU performance. Any less than this and all the expense isn't really rewarded. However, for the many PC musicians, like me, with a Pentium 4 3GHz processor or similar, the required 4.5GHz model never appeared. Instead, Intel abandoned plans to 'break the 4GHz barrier', and both Intel and AMD switched to multiple-core technology, which places two or more processor cores on a single piece of silicon. Each of the cores would be under-clocked, compared with the single-processor equivalent, and would run at a lower voltage, so while a multi-core CPU would be faster overall, it shouldn't run much hotter or require an exotic (and possibly noisy) cooling regime. 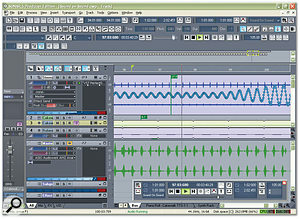 Dual-core processors duly appeared from both AMD and Intel during 2005, but at first no-one knew what practical improvements could be expected with audio applications. However, SOS has now reviewed models from both camps, so I can safely say that for anyone who has been waiting for a good reason to update or replace their current computer, upgrading to a dual-core system is worth doing. In my case, I estimate that it could provide an increase in processing performance of 100 percent, or even more. Despite the undoubted advantages, many musicians are hanging back because of reports of audio conflicts, incompatibilities and other problems associated with the PCI Express chip sets used on many dual-core motherboards. I first discussed these problems in PC Notes September 2005, but apart from this exposure they are not widely known outside the SOS PC Music forum and a few other audio-specific forums. Some musicians have thus bought new PCs only to find themselves with a variety of symptoms, including unexpectedly high CPU readings and incurable audio stuttering. Some have found themselves having to run their audio interfaces with extremely high buffer sizes, resulting in latencies approaching 50ms. If you already have a pre-PCI Express Socket 939-equipped AMD Athlon motherboard, there's one easy way to avoid such problems: see if a BIOS update is available from the motherboard manufacturer to support the newer dual-core Athlon X2 processor range. If this proves to be the case, all you have to do is update the BIOS of your current motherboard, remove its single-core processor, pop in a new dual-core model and carry on with greatly improved performance. For those faced with the prospect of buying a new motherboard that supports either AMD or Intel dual-core processors, PCI Express becomes a fundamental consideration. Should you buy a motherboard/chip set that supports it or not? Although I first discussed this new technology way back in PC Notes of November 2002, no hardware actually appeared on the market until mid-2004, and even now the practical benefits of PCI Express to the musician are shrouded in mystery. So what exactly is it all about, and just how relevant is it to the musician? 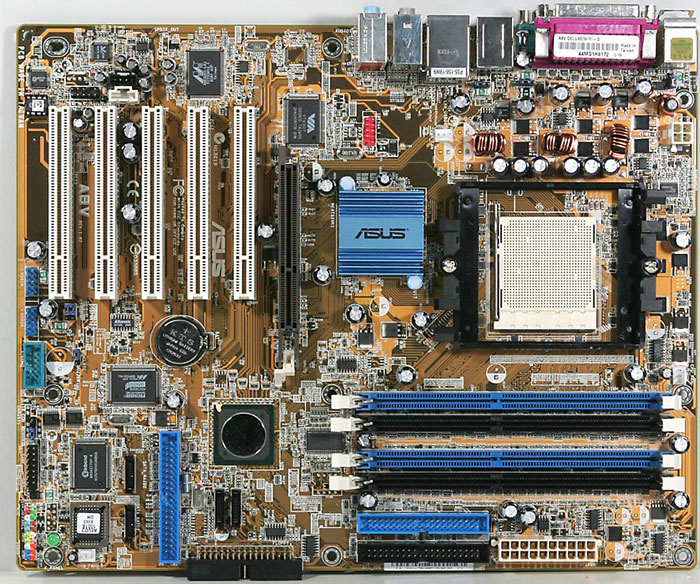 The easiest and cheapest way to achieve dual-core performance is to ignore PCI Express and use an older motherboard, like the Asus A8V shown here, coupled with an AMD Athlon X2 processor. The classic PCI buss is 32 bits wide and runs at 33MHz, providing a peak bandwidth of 132MB per second. This bandwidth must be shared between all the devices attached to the buss, but nevertheless it's possible to run up to 32 input and 32 output channels of 24-bit/192kHz audio, and the huge number of very capable music PCs out there prove that PCI is quite sufficient for many of us. PCI Express is a new, higher-speed buss that provides each device with direct access, rather than making it fight for its share of PCI bandwidth with other devices, and it also supports hot-plugging. Since a single switch-chip is in control of resource-sharing decisions it can also prioritise data packets, so that (for instance) real-time streaming of audio and video data can take priority over other less time-critical data. Each connection between a PCI Express device and the PCI Express switch controlling I/O traffic is termed a 'link', and is composed of one or more 'lanes' that can send and receive one byte in each direction simultaneously. The simplest PCI Express expansion slot supports a 'x1' link that has one dedicated lane capable of transmitting 2.5 Gigabits per second simultaneously in each direction. With error correction it takes 10 bits to transmit an 8-bit byte, translating to 250 megabytes per second. PCI Express Motherboards generally offer a 'x16' graphics slot, running 16 lanes in parallel, to boost its bandwidth to 4GB per second, but it can support any combination of link widths from the range x1, x2, x4, x8, x12, x16 and x32. A PCI-to-PCI Express 'bridge' is needed to provide support for older PCI devices, and such bridging can either be on the motherboard (so that it can offer PCI slots as well as the newer PCI Express ones) or even on a PCI Express card (some early PCI Express cards may fit in the shorter PCI Express expansion slots, but they are actually PCI designs with an on-board bridge). Although many PCI devices seem to work fine in PCI Express motherboards with legacy PCI slots, it seems to be the bridging implementation on some motherboards that's causing problems when musicians plug PCI audio interfaces and DSP cards into them. Because the USB and Firewire ports all hang off the PCI buss, devices plugged into these can be affected as well. In the worst cases, even hard drive performance can suffer. 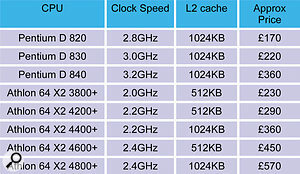 Here are the eight dual-core processors most popular with musicians, along with guide prices, as of January 2006.If you want an Intel-based system, you only currently get three choices of processor in the Pentium D range, while the AMD Athlon 64 X2 range currently comprises five models. I compare the performance of the two ranges in the main text, but there are a couple of further points to bear in mind. First, the AMD range has two cache sizes, and the jury is out on just how worthwhile the larger size is for audio applications. If you run a lot of reverb algorithms, it's possible that having a larger cache will benefit overall performance, but many experts don't think it's worth the extra money. Consequently, lots of musicians choose the 4200+ model over the 4400+ with identical clock speed, and the 4600+ over the 4800+. Anyone considering the 3800+ model should seriously consider spending a further £50 to gain the additional 10 percent of clock speed of the 4200+ model. The latter is the current favourite. The second thing I want to point out is that while one of the older nForce3 or K8T800 Pro motherboards to partner an Athlon X2 can be bought for between £60 and £80, PCI Express motherboards to partner an Intel Pentium D processor may cost you £130. New technology is always more expensive, and the extra £50-70 may let you buy the next fastest AMD CPU. So, after that little burst of theory, what does having PCI Express slots actually mean in practice to the average punter? Well, their main raison d'être at present is faster and more sophisticated graphics, courtesy of the single x16 PCI Express slot. However, for most musicians a performance boost over budget AGP graphics card is largely unwanted, because they don't need the extra graphic power to run 3D modelling applications and games and will usually want to avoid the cooling fans found on most faster PCI Express graphic cards. Furthermore, with some PCI Express chip sets, many of the current PCI soundcard click and pop problems can be reduced or eliminated by replacing esoteric x16 graphics cards with much more modest alternatives. 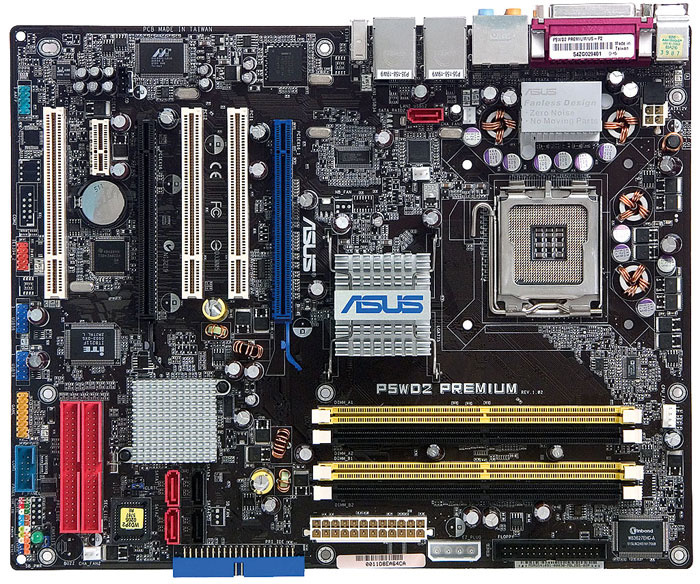 If you want a motherboard equipped with PCI Express slots, the current safest approach is Intel-based, and one of the most popular models is this Asus P5WD2. So if the x16 PCI Express slot doesn't end up all that exciting to most musicians, what can we do with the remaining x1 PCI Express slots? At this stage we have to take a leap of faith, since few PCI Express peripherals are yet available. I have spotted some TV tuner cards and a few PCI Express to Firewire adaptors, but for musicians I suspect PCI Express motherboards will only have something really significant to offer once soundcards and other audio-related products become available. One or two may be available by the time you read this, such as Digidesign's PCI Express Core and Accel cards, and maybe even new products from some of the audio interface manufacturers I talked to in SOS December 2005, who were cagey about revealing details of forthcoming products too soon. It's too early to say whether these will all simply be replacements for existing PCI models, or whether they will offer new 'must have' features, such as more simultaneous I/O channels than can currently be accommodated by PCI bandwidth. PCI Express also offers a feature called QoS (Quality Of Service), which some believe could offer guaranteed 'no-glitch' audio delivery, given suitable drivers. Overall, PCI Express offers tremendous potential, PCI devices will eventually die out, and the current teething troubles will no doubt be eradicated as new motherboards are released. However, just at the moment, it offers few practical advantages to the PC Musician. Buying a dual-core system can be problematic enough in itself, but if you've already got PCI hardware that you want to carry on using with it, you have to be even more careful. Most PCI audio interfaces should prove compatible with the hardware I recommend in the main text, but a wrong choice could result in you having to increase buffer settings considerably, so I would recommend that anyone currently running an audio interface with an I/O count of more than 16-in/16-out contacts the local distributor of their interface to check on their model's compatibility with the chip set/motherboard they intend to buy. Better safe than sorry! The hardest job falls to those with audio DSP accelerator cards, which can put a tremendous strain on any PCI-based system. Future PCI Express versions of the Powercore and UAD1 are likely to prove very popular for this reason, but if you've already invested in the current PCI versions, the PCI implementation in a dual-core system is particularly important. The best place to check for up-to-date information is the DSP-card manufacturer's web site, but I've had reports from various musicians that the Asus A8V Deluxe is quite happy running UAD1 DSP cards. Making sure you're running the latest version 4 drivers helps. Universal Audio themselves say that their version 4 has an "optimised Turbo DMA engine" that "provides full support for the latest multi-processor and multi-core systems". In the (hopefully) unlikely event that Turbo DMA mode causes any glitches or drop-outs in your system that weren't there before, you can disable it with a special Registry key. Universal Audio specifically warn against using the Nforce 4 chip set, because it causes choppy audio and CPU spikes. They also provide warnings about other motherboards, which you can read at www.uaudio.com/support/software/UAD-1/motherboards.html. Owners of newer Powercore cards generally seem to run into fewer conflicts, and TC Electronic themselves say that no issues have been reported regarding Powercore Compact and Firewire units running with Athlon X2 systems. However, those with older Powercore versions may apparently run into problems getting them recognised by the BIOS on some of the latest computer systems. If you come across this problem, a workaround is to press the system restart button before Windows starts loading, to give the system a 'second chance' to detect it. TC are currently working on a driver update that they hope will resolve a few such issues with Powercore Element, PCI and PCI Mark II units. The two most popular dual-core processor ranges are Intel's Pentium D and AMD's Athlon 64 X2 , so I'll be concentrating on them. Intel managed to put audio problems behind them with the more recent 945/955X series chip sets for their Pentium D dual-core range. 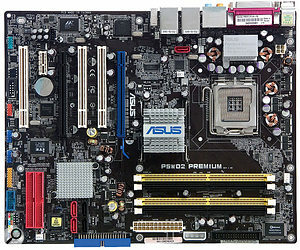 Systems using the 955X chip set in particular seem to be popular among specialist music retailers, with the Asus P5WD2 being the most popular motherboard. It offers three PCI slots, one x1 PCI Express slot, one x16 PCI Express slot, and one 'universal' x16 format slot that can run in x2 or x4 modes. AMD enthusiasts face a rather more confusing set of choices. The easiest option (and currently one of the most popular) is to totally ignore PCI Express, as mentioned earlier, and simply opt for an older motherboard model that now supports the newer dual-core processors via a BIOS update. (Do be aware that you'll probably need a single-core processor in place first to update the BIOS). Dual-processor results take the top three positions in my Cubase SX performance table, but the AMD Athlon X2 range is significantly ahead overall.The most popular motherboard in this category seems to be the Asus A8V Deluxe, which features the K8T800 Pro chip set, along with five PCI slots and one AGP slot, and comes highly recommended by many DAW builders, especially as it's one of the few X2 boards that's proved compatible with Universal Audio's UAD1 card (see box below). Another popular model with identical chip set and slots is Abit's AV8 (as used in the Scan PC system I reviewed in SOS January 2006). These both work well with most soundcards, including those from Edirol, Emu and M Audio, although Echo's five-year old Mia won't work with them. A third and possibly more compatible alternative (which Echo have confirmed works with their Mia) is MSI's K8N Neo 2 Platinum, which features Nvidia's Nforce 3 chip set and a similar complement of slots, but unfortunately also has a chip-set cooling fan, unlike the other two. PCI Express arrived on the AMD scene in late 2004 with Via's K8T890, ATI's Radeon Xpress (the company's first foray into the AMD chip set market), and Nvidia's Nforce 4 chip sets, available in three 'flavours': Nforce 4, Nforce 4 Ultra and Nforce 4 SLI. Unfortunately, Via's K8T890 chip set proved to be incompatible with AMD Athlon X2 processors when they were subsequently released, and although a newer version of the K8T890 was released later, this chip set hasn't proved particularly popular with motherboard mainfacturers. A similar fate befell ATI's Radeon XPress. This leaves the Nforce 4 chip set, which has proved very popular with gamers but extremely troublesome for musicians installing single-core Athlon 64 processors. However, as I write this in early 2006, the latest news is that if you instead install a dual-core Athlon X2 model the problems are significantly reduced — so much so that some DAW builders are reportedly starting to use Nforce 4 Ultra motherboards such as MSI's K8N Neo 4 Platinum model (with four PCI slots, two x1 PCI Express slots and one x16 PCI Express slot). 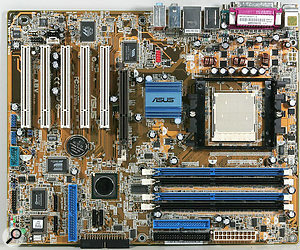 Even Digidesign (normally extremely cautious to recommend the latest PC technology) are recommending the Asus A8NE motherboard, again with Nforce 4 Ultra, for use with their MBox and Pro Tools LE 7.0 for Windows XP. Since dual-core processors offer two CPUs running on one chip, you'll only achieve improved performance if your software can take advantage of both of them. As with a true multi-processor PC with physically separate processors, and Intel's Hyperthreading processors, this requires the software to support multiple software threads running simultaneously. Fortunately, most audio software shows significant performance improvements with a dual-core processor. Applications confirmed to benefit from dual-core processors include Steinberg's Cubase SX and Nuendo, Cakewalk's Sonar and Digidesign's Pro Tools for Windows XP. Some other software may be written to run as a single thread, and will only therefore utilise one of the two cores on a dual-core processor. Since each of these cores runs at a slower speed than a comparably priced single-core CPU, this may actually result in worse performance. One exception is Tascam's Gigastudio, whose sample-streaming engine is tightly written for a single-core processor. Polyphony shouldn't suffer, as this is more dependent on disk I/O than CPU performance, and Gigastudio plug-in performance can apparently take advantage of the other core. Leaving PCI Express completely out of the equation for a moment, there are two further things to consider: acoustic noise and AMD/Intel relative performance. 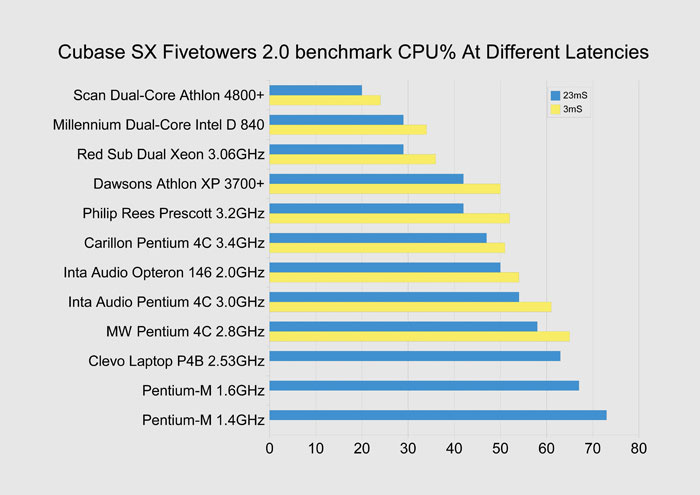 The first is easier to quantify: the Athlon X2 series dissipates about two thirds of the power of the Intel series, and it has proven easier to keep an AMD system cool with slower running fans (and therefore lower noise) than an Intel Pentium D system of roughly equivalent performance. Cakewalk's Sonar is one of the audio applications confirmed to benefit from dual-core processors.However, actually establishing systems of roughly equivalent performance is a trickier matter. Everyone is agreed that dual-core processors provide far better performance, when running most software applications, than their single-core predecessors running at the same core speed, but it's becoming very difficult to give hard and fast performance comparisons of today's computers, as relative test results seem to vary so much depending on the chosen application and its settings. 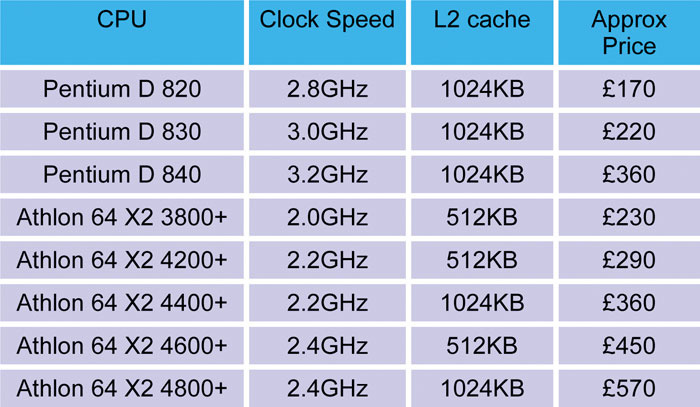 The results are further confused now that the internal architectures of AMD and Intel processors are so different that you can now longer rely either on clock speed or model number to indicate relative performance. I've seen test results I trust that suggest an AMD X2 3800+ system is roughly equivalent to an Intel D 820 system in performance on large Nuendo projects, although in other audio tests with Cakewalk's Sonar it takes a significantly faster AMD Athlon XP X2 4400+ model to equal the D 820. However, this balance shifts with latency: on this point the AMD 4400+ often moves significantly into the lead, with buffer sizes of 12ms and lower (after all, the more desirable values for 'real time' performance and playback). 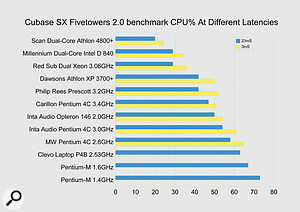 My own results with Cubase SX suggest that in some tests AMD's slowest X2 3800+ model can hold its own against a rather more expensive Pentium D 840, so I conclude that, as well as being easier to keep cool, AMD's X2 series must be declared overall winners in the performance stakes, particularly at lower latencies. However, in its favour the Pentium D-series does offer a considerable performance boost over single-core P4s, and similar performance to some Dual Xeon systems at significantly lower cost. So, after all these caveats and conundrums, should you take the plunge and upgrade to a dual-core system? I think the answer is yes, because of the potential improvement in performance. For instance, if you currently have a reliable but aging 3GHz Pentium 4 Northwood PC, or thereabouts, you will get about double the performance by buying an Intel Pentium D 840 PCI Express or an AMD Athlon X2 3800+ PCI system with Nforce 3 or K8T800 Pro chip sets. Those who can afford a faster X2 processor can achieve even more. The big question is whether or not to adopt PCI Express. There are those that will ridicule buying 'old technology' like an Asus A8V motherboard with Nforce 3 chip set to partner an X2 dual-core processor, but the fact remains that if you've already got PCI cards you want to carry on using, and particularly if you use Powercore or UAD1 cards, such a system is currently likely to provide the best performance. Having some PCI Express slots will provide you with some future-proofing and the option of higher-powered graphics, and for greatest compatibility you should currently buy an Intel Pentium D system, at the expense of slightly reduced performance. Buying an Athlon X2/Nforce 4 system will provide better performance than this, but the UAD1 won't work with it at the moment, and you may still not get quite the same overall performance as a cheaper Athlon X2/Nforce 3 system. Of course, there's another approach, and that's to wait a little longer. There are plenty of interesting releases on the horizon, including AMD's 940-pin Socket AM2 format, expected by mid 2006, along with a new range of compatible X2 processors. By that time the current AMD/PCI Express audio issues may have been resolved. Intel may have released their Yonah CPU range, a dual-core version of the extremely popular Dothan models used in Centrino laptops, by the time you read this, and if it proves to be as powerful and easy to cool as some are hoping, and finds its way into desktop systems, musicians may be queueing up to buy it instead of a Pentium D system. However, there's always something better around the corner, and many of us have been waiting long enough!